You can add color to your indoor garden during the drab days of winter by forcing bulbs into bloom. Forcing causes bulbs to flower before they normally would outdoors. Start the process in autumn. Buy the best-quality bulbs you can find. When you pick out bulbs, examine them thoroughly. You want bulbs that are firm and solid, with no mold, soft spots, or physical damage. Store tender bulbs in a cool location 45 to 55-degrees F with good air circulation. Store hardy bulbs in the refrigerator 35 to 4-degrees F. Even hardy bulbs will not survive in the freezer. Lacking the insulating protection of soil or snow that they receive when planted outside, bulbs will succumb to frostbite. It takes 8 to 12 weeks to force bulbs into bloom, so plan ahead. Plant your bulbs in 5- to 6-inch-diameter pots filled with a well-drained, porous medium such as a mix of equal parts potting soil, peat moss, and sharp sand. Use pots with drainage holes. A conventional 6-inch pot will accommodate three daffodils or hyacinths or five to six tulips. Smaller bulbs, such as crocuses or netted iris, can be forced in a 5-inch bulb pan (a pot that is wider than high). Planting. Most bulbs can be planted with the tips exposed. Don’t bury them completely unless noted in the table at right. Set them so that the soil level will be about 1/2 inch below the rim of the pot. 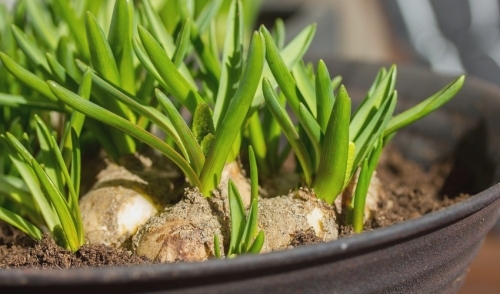 Plant as many bulbs as will fit in the pot, leaving about 1-1/2 inches of space between them. Water to thoroughly moisten the soil mix. Cover the pots to keep out light. Water and Light. Check the pots weekly to be sure the soil remains moist but not wet. Do not fertilize. When the chilling period is over, bring the pots into bright light to produce flowers. Most bulbs do best in a bright but rather cool location indoors. Water to keep the soil evenly moist. for 6–8 weeks Soak tubers before planting until they’re soft enough to dent with a fingernail. for 8 weeks Water sparingly until plants are fully grown. Then keep evenly moist. for 8 weeks Plant corms deep enough to just barely, but completely, cover them. Plants need 10 degrees F temperature drop at night. for 8 weeks Easiest of the hardy bulbs to force; can be forced in water or soil. for 3–4 weeks As plant grows, feed monthly with an all-purpose fertilizer. Narcissus papyraceus No cold period needed Can be forced in soil or a pebble-filled bowl of water. Practically foolproof. for 12 weeks Plants do best in cool temperatures of 60–65 degrees F.
for 12 weeks Plant bulbs with tips 1/2-inch deep. As plants grow, give them bright light but no direct sun.